The location was an offshoot from an entrance to a very nice Hotel in Tyson's Corner, Virginia. The "Take It!" came in the recognition of being at the right place at the right time. 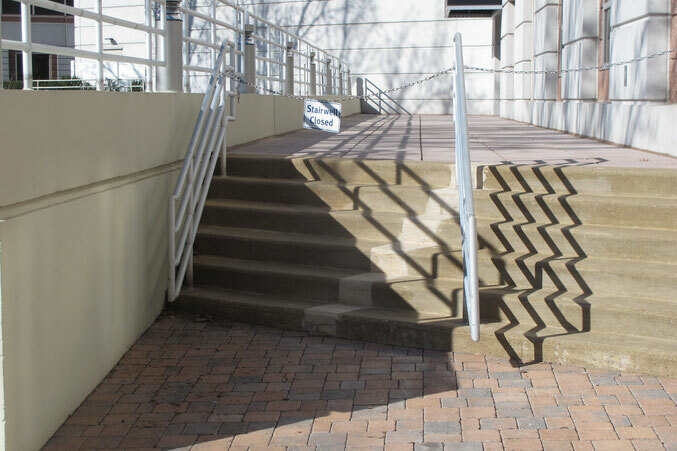 the sun was casting shadows from the railing support structure onto the concrete steps on the right side which gave a sort of zigzag, spring like, look - while on the left side of the railing a shadow was being cast from another railing that was located on a short wall above the stairs which gave it a contrasting straight line. The After Take: This is one of those very lucky shots that makes me smile every time I look at it. If I am fortunate enough to encounter this again - I will take the time to actually walk on the shadow on the right to see if my imagination will afford me just even the smallest illusion of some "spring in my step"
This photo has been chosen for the banner for the season - for - "Spring" - is what it will represent - with all the good things that come with it. All my best to each of you as we move from this Winter that has been so difficult for many. Out best wishes are with this new season which for many, is the time of renewal. The zigzag shadow looks pretty cool. Would make a neat wall pattern. Very nice shadow work, great catch! I am sitting here wondering why they closed the stairs. I don't get it. Btw cool shadows! Ah yes, a great time of year indeed. Time for everything to come back alive. Happy Spring everyone!